Lead a ragtag band through the desert. 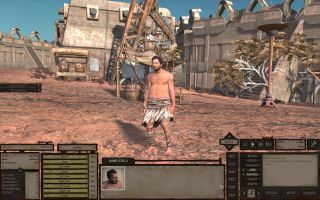 Kenshi, which first appeared on Steam Early Access way back in 2013, is as a peculiar and ambitious RPG. It is, at times, an RTS, a squad management game, a trading RPG and several other things, depending on the life you decide to lead in the massive sandbox. It’s leaving Early Access on December 6, 12 years after work initially began. It reminds me a lot of one of the greatest sandboxes and one of the best RPGs on PC, Mount & Blade: Warband. It’s got that mixture of roleplay, strategy and management, and stumbling around in the dark, utterly clueless, is just as much fun. Wanting to take it for a spin before it was properly let out into the wilderness, I made a character who really encapsulated me, but if I was stuck in a post-apocalyptic wasteland. Meet Jim Dimly, a chubby, slightly cowardly wanderer. Jim’s not got much going for him. In fact, all he has are a scruffy pair of trousers and a small amount of cash. Oh, and a stick. But what else does one need? I start out exploring a ruined town, but finding nothing worth pinching, I leave, heading towards a point of interest on my map. It’s a bar, but not just any bar! This bar, which doesn’t seem to have a name, also has a rather striking outdoor feature: a pile of bloody corpses. The corpses, it turns out, are the victims of the bar’s bouncers; they’re all rather tough and well-armed. I spend my meagre funds on a giant barrel of water—I am in the desert, after all—and a crap crossbow. When I’m leaving, however, I wander right into a massive pack of bandits. They want my food, but I don’t have any, so I can only assume they plan on eating me. I run back to the bouncers and the pile of corpses gets bigger. As I wander off into the vast sandy void, my mind returns to the bandits. Wouldn’t it be nice, I think to myself, if I had some friends to explore with, instead of going it alone. I started again. Kenshi lets you pick from a multitude of starts, ranging in difficulty and what you’ll be doing. You can, for instance, start out as a well-prepared group protecting a base, turning it into more of an RTS. I opted for a simple group of penniless travellers. The Rust Boys are a band of junk robots and their mate, a small human called Bland. I could have also included muscular ants and a weird purple monsters. The future’s a wild place. We start in the ruined town again but this time ignore the bar and head straight to the nearest city, narrowly avoiding some nasty looking predators on the way. We’ve got no money or resources, so hopefully the town will have some work for us. The dream is to eventually build a lovely wee community where everyone, human, robot, ant and whatever those purple dudes are, can live happily alongside one another. The town’s guards attack us immediately. Unfortunately, the town belongs to religious group that despises robots. I couldn’t have picked a worse place to visit. After a brief battle, everyone is unconscious. All the robots are just left to rust where they fall, but Bland, our human friend, is put in jail. They like him more. We’re not dead, though! Given enough time, the whole squad can reboot. Every time the guards see movement, however, they attack again. It’s going to be up to Bland to save the day. Once he’s finished his sentence, anyway. I have no idea how I’m going to get out of my predicament, or if it’s going to be possible for Bland to somehow mount a rescue, but I’m very much looking forward to finding out.